There may be some delays in the next week about the Brother and any passing information. Although, that does not mean this time is being squandered. A trip to the fashion district of Los Angeles will hopefully afford quality research time at some of the local industrial sewing machine shops that the area offers. It is a sea of textile industry in that niche of the city, and some of the shops have so much to look at that it can become a taxing experience if you are not prepared for the amount of time it takes, but it always brings to light new information which can only be to the Brother’s benefit. One of the key interests is in finding presser feet for the Brother. 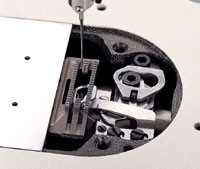 Because it is a needle feed machine, it is unlikely that there are gated feet with the special longer cut groove, but if there is one place to find such a thing (or things) this is the area to find them. Ideally a whole set can be pieced together, but if it turns out that these do not exist – so be it (a bit of Dremel work will accomplish the task of redesigning the rest of the existing feet). As to the last comment left about the thread trimmer, vs. thread trimmer, vs. Brother DB2-B791-015. The question can be summed up with one word – both. 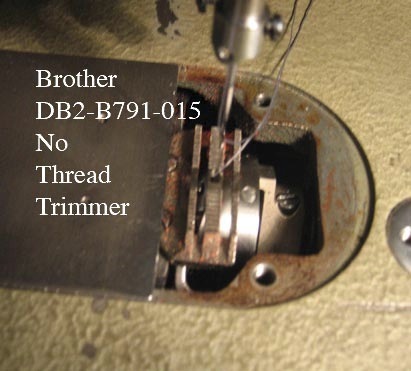 Or at least should it be said that yes the picture which reads “Brother DB2-B791-015 No Thread Trimmer” does lead one astray. It should read – Brother DB2-B791-015 shown here without a thread trimmer to see what it looks like when there is not one – so readers can compare the two pictures and better understand the mechanical difference, whether that is to be believed physical or not. Although, the comment also brings to light another very sophisticated question about the Brother DB2-B791-015, and whether or not it is not just an industrial sewing machine. To this, it must be said that the Brother DB2-B791-015 is more than just that, it is a very unique device that depending on why it is thought to be used can alter its productive outcome. Some may think that it can only join material together, but in reality, by doing that it must also then have a very deep relationship with materials (trickling down or up from there when one zooms in on what either comes before or after that) that sets it up to push and pull physical matter in a way that people may not always consider. Suppose – maybe the Brother is a unit which travels throughout it’s history in a non-linear manner (much like it was mentioned this site or blog may work) therefore not just joining material, but truly endeavoring in what material is, why it is joined together, and how these normative functions of a (perhaps) textile based society have either progressed or not. However, unfortunately, these are only terms used to describe less than an inkling into how it may be something other than an industrial sewing machine, which may abstract too easily. Ideally with time, as this site grows, the information provided within it will help describe the separation between industrial sewing machine (for producing product) and industrial sewing machine as brain – and this overarching issue will become more transparent.